The Gilkey Bridge, approximately five miles north of Hoffman, is the only standing remainder of what was once the town of Gilkey. The Hannah Bridge is a popular spot with fishermen and swimmers; a rope swing dangles from beneath the bridge. The last bridge in the Scio loop is Larwood Bridge, which sits in Wayside Park at the confluence of the Roaring River and Crabtree Creek. Covered bridges are one of Oregon’s little secrets. 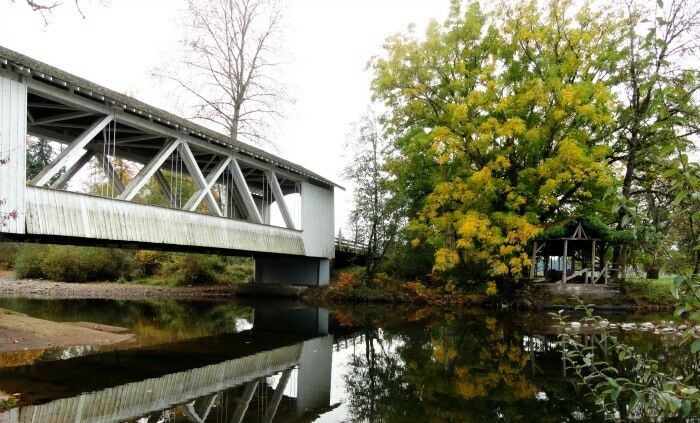 I’m a fifth-generation native Oregonian, and I grew up with graceful old Weddle Covered Bridge in my hometown of Sweet Home. However, I didn’t realize until recently that Oregon’s abundance of covered bridges is a rarity. Turns out, not every kid grows up playing on a covered bridge in their city park. 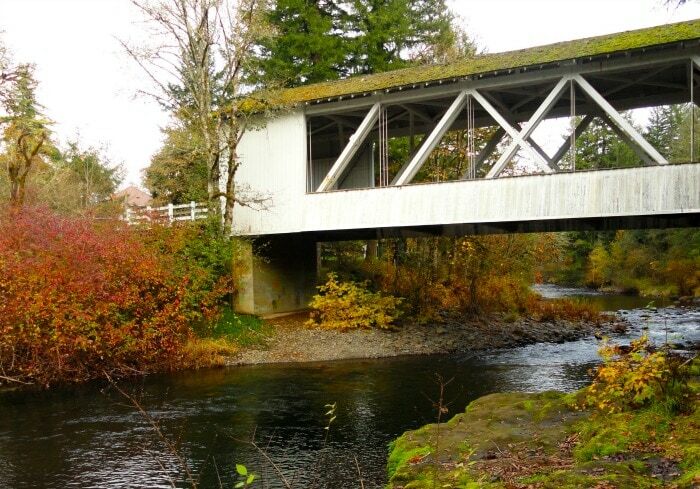 In fact, with 51 covered bridges, Oregon has more covered bridges than any other state west of the Mississippi. Why Oregon? The rain. Pioneers didn’t put roofs over their bridges just for fun — covering the wooden bridges kept them from rotting away in the Northwest’s damp weather. But bridge-builders are practical people, and once steel and concrete came into widespread use, there was no need for quaint little roofs on bridges. Time marches on. A confession: even though five of these quirky reminders of Oregon’s pioneer past are clustered on a loop that begins just 20 minutes from my home in Albany, I’d never been out to see them. Armed with a camera, I headed out on a sunny day this fall to remedy that situation. Nestled into peaceful farm country, surrounded by colorful leaves and glistening reflections, covered bridges are just too pretty to resist photographing, whether you’re a professional or a just a snap-happy traveler with a smartphone. 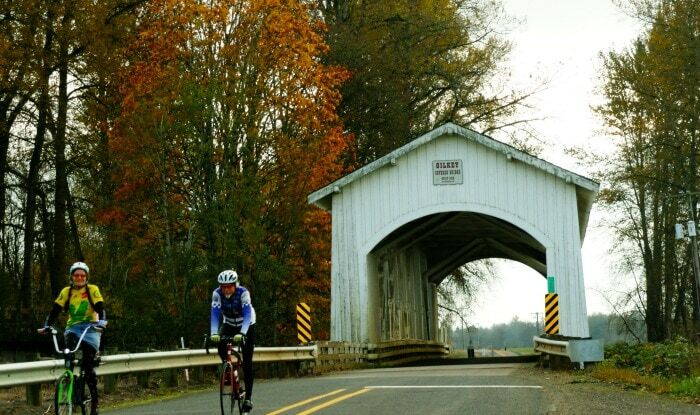 If you don’t already have a guide to Oregon’s covered bridges, you can pick up step-by-step driving or cycling directions at the Albany Visitors Association. I headed east on Highway 20, then turned onto Highway 226. I’m usually not a leisurely driver, but I found myself taking my time in covered bridge country. The route passes by filbert orchards, Christmas tree farms, and alpaca ranches, and I found myself tempted to stop around every turn to capture another scenic image. The first bridge on the loop, Hoffman Bridge on Hungry Hill Road, is currently a restoration project in action, and I stopped for a few minutes to watch the workers repairing the 77-year-old bridge (restoration is expected to be complete by Nov. 30). The Gilkey Bridge, approximately five miles north of Hoffman, is the only standing remainder of what was once the town of Gilkey. Large curved portal openings and exposed trusses let daylight stream in as cars and cyclists pass through. A pair of cyclists greeted me as I pulled over to admire it. After Gilkey Bridge, I headed northeast to the quiet town of Scio — billed as the covered bridge capital of the west — and stopped at the Covered Bridge Café on Main Street. It’s all about the bridges at this friendly spot: you can purchase a covered bridge T-shirt, admire bridge-inspired artwork on the walls, and even eat a specialty burger named after one of the nearby landmarks. The café was shut down for 54 days in 2012 after Thomas Creek flooded downtown Scio, but it’s been remodeled and re-opened. I opted for a latte and a homemade dessert: the peanut-butter-chocolate bars are gooey and delicious. East of Scio is Shimanek Bridge. The only red covered bridge in Linn County, it stands out boldly among the trees and fields. At Hannah Bridge, I got brave and scrambled down the bank, so I could walk downstream to capture shots of the mossy rocks and woodsy riverbanks that frame Hannah. The spot is popular with fishermen and swimmers; a rope swing dangles from beneath the bridge. The last bridge in the Scio loop is Larwood Bridge, which sits in Wayside Park at the confluence of the Roaring River and Crabtree Creek. As soon as I stopped, I knew how the Roaring River got its name: the sound of rushing water filled the air. Across the stream are the picturesque remnants of water wheel that provided power to rural farmers in the early days of the 20th century. The current is slow, and I found myself snapping shot after shot of the gorgeous reflections of both the water wheel and the bridge visible in the water. A dedicated covered bridge explorer can continue via back roads to the small town of Sweet Home. Stop at Mark’s Ridge Winery— one of the highest-elevation wineries in the Willamette Valley — and enjoy a glass of wine while taking in a stunning view. Three more covered bridges are in the eastern half of Linn County: Weddle Bridge in Sweet Home, Short Bridge in Cascadia and Crawfordsville Bridge in Crawfordsville. From Crawfordsville, you can turn south to Lane County, where more covered bridges remain on the Cottage Grove Covered Bridge Tour Route. But the sun was beginning to set by the time I finished exploring Wayside Park, so I packed up my camera after visiting Larwood and headed home. Five covered bridges down, 46 more to explore. 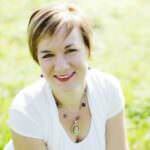 Jennifer Rouse relishes the chance to write about Oregon. A fifth-generation Oregonian, Jennifer loves running, wandering through bookstores, and feasting on local wine and cheese. Alongside her husband and three daughters, she likes to explore hidden corners of the state via car, foot, bike and canoe.